And Those Who Hate Guns Claim We Believe Guns Have Magical Properties? Not long ago I had an epiphany of sorts regarding how people ascertain truth and how that relates to faith. You see for me, faith is never, ever checking my brain at the door. It is not a denial of truth or believing something in face of ‘conclusive’ evidence of its falsehood. No, every single one of us has faith of some sort. It’s how we live and there is no way around it. You see, unless you are omnipresent, for all of time, you cannot verify an event took place with any degree of certainty without having some kind of faith. You trust your sources, your senses, or both. Unless you were a witness to the events in question, you take on faith that the video, the audio, the pictures, the story as it is passed on, has not been modified between when it was witnessed and when it has gotten to you. You try to verify the best you can, but unless you were there, there is no 100% proof. Only evidence of likelihood. Even in the case of scientific experimentation, how do you know that those scientists, those people nearly deified by elitist, did not falsify their data or their results. Maybe to hide the decline. Ever notice how evasive some of them can be? For best results on the first point, whom do you trust, it’s important to evaluate that person’s reliability in the past. It’s good idea to look at both the person’s followers and detractors. But in both those cases, the closer proximity in both time and space, the better, I would think. And, of course, what is the reliability of each of those followers and detractors? You could go on ad-infinitum, but we are talking about a lifetime of learning here, anyhow. It takes time, but it’s not that hard to develop a skill to determine who are the truth tellers who makes things up or bends the truth. When you throw out your preconceptions, the liars stick out like sore thumbs. Most of the time, anyhow. It’s more art than science. On the second point, where your threshold is, it’s a very individual, subjective thing. However, setting it too high is dishonest. We all make a decision, conscious or not, to finally say, “I believe,” and act it out in our lives accordingly. Set it to low, however, and you’d be quite gullible, falling for anything. Oh, sure, there are skeptics who say that they never believe anything. That belief is an impediment to knowledge. Man, I don’t think I’ve ever heard such nonsense sophistry. No one truly lives like that. You take actions based on beliefs you have. I step off the sidewalk expecting that gravity will draw my body down toward the earth and successfully plant my foot on the road as I begin my journey across the street. There’s always the opportunity to revisit what you believe based on new knowledge and modify what you believe. Or not. I bring this up because of accusations I’ve often seen that gun owners believe that guns somehow magically make them safer simply by their presence. That they will be able to shoot like John Wayne and take out or run off four bandits (well, he did have some help from the Texas Ranger — who was late, by the way). Two problems here. First, he sets up a straw man theory and then claims to have drove a hole in it. Problem for him is that it wasn’t my theory. I never said, nor do I know of anyone who has said that the mere presence of guns will stop an attack. They have to be actually be utilized. In this case, the bad guy was actually taken out, anyhow, before he could shoot, and possibly kill or injure any more. So the attack was in, fact, stopped. If the only person with a gun was the one cop who the suspect snagged it from, we’d probably be reading about a lot more injured and even some dead cops. ‘scuse me, but no one is saying that Newtown would have been stopped, only that it was all but guaranteed that it could not have been stopped under current law where they are prohibited from carrying. The presence of guns isn’t some magic talisman that will automatically prevent all evil. It only improves the odds for good people with guns. You look at the costs of the proliferation of guns, but dig your heels in and refuse to the see the benefits. What boggles my mind is that you and your ilk seem to believe what you sometimes accuse me and my ilk of believing. And that is that guns have some magical quality. We are often accused of believing that a gun is some sort of talisman that solves all problems. No, it just improves our odds, levels the playing field in many cases. Yet it seems all those opposed to armed teachers think that ‘kids and guns don’t mix’ like they have some sort of magical power and will overtake the people around them with evil. They are inanimate objects under control of their operators. Concealed, and out of sight, there’s not even any concern about how kids would feel about the sight of people carrying guns around. The teacher who lunged at the shooter had nothing but her body to stop the bullets, which though possibly effective, ended her own life. Had she sent a hail of her own bullets in his general direction, he either might have, just maybe thought twice about continuing his attack against her and her charges, or been stopped in his tracks. The odds would have at least significantly tilted in favor of the victims, yet you would deny them that possibility on penalty of prosecution for the crime of wanting to protect themselves and their charges. The cops need guns to apprehend intransigent suspects, but there is the chance (actually, greater chance due to their more frequent close proximity to suspects) that their own guns will be used against them. If trained (and there are lots of trainers stepping forward to offer free or discounted training to any teacher who wants it) a teacher could utilize a gun to at least be able to attempt to hold off (or maybe even stop) a madman until the cops show up. Jeanne Assam likely saved tens or even hundreds of churchgoers, when you consider how many rounds the madman had and where he was headed after killing two sisters in the parking lot and two others earlier. When you read her account of what actually took place, I would challenge anyone to demonstrate that any kind of expensive, time consuming training was needed. Simple determination and accuracy (and certainly, bravery) was all that was needed. The fact that she was a former cop may have better prepared her mentally for it, but the training to get the job done is available to anyone who is willing. So, no, my theory hasn’t had a hole driven into it. The only theory that had a hole blown through it was the fake one that he made up. These people really seem to believe that guns have some magical power. Why? Because they are designed to kill? There’s no point in even arguing whether or not they are, indeed, designed to kill. (As I said a while back, I want something that is designed to kill. What they describe with the scare word deadly, we call effective. The conundrum here is that absolutely every single quality of a particular firearm that makes it more deadly in the hands of criminal, also makes it just that much more effective in the hands of a good guy. And that’s what we want, and what every individual in this nation, save the criminals and tyrants themselves, should want.) The point is, as Robb has pointed out, intent is not transferable. It just doesn’t matter whether or not an object was designed with ill intentions. Crafty people can come with positive uses for it. 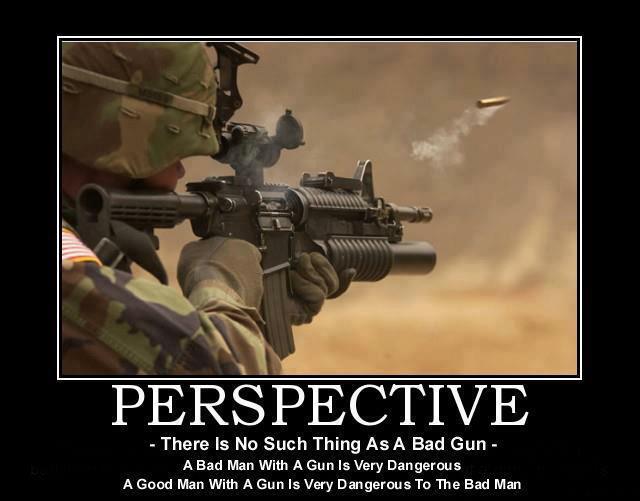 Just as an object designed with good intentions can be used by men of ill repute for evil. Intent is not transferable. Again, as described in A Gun Is Not An Argument, the invention of the gun was very clearly a positive development. The anti-liberty crowd might wonder what a world without guns would look like and long for it. But there is absolutely no need to wonder. We already know what it would be like, because we know what it was like. Murder and mayhem by those who trained all their lives for it. And no viable means to defend against it without giving up a normal life. What pisses me off is that the vast majority of those proposing more restrictions, haven’t a clue about firearms. They put their trust in those feeding them their talking points. So regarding the first point above, they put a high degree of trust in other people who happen to believe and feed them what they want to hear. And to the second point, they keep the bar very low for threshold of evidence for believing something that matches their own preconceptions. It’s been said that the best way to make a pro-gunner out of an anti-gunner is to take them shooting. Given how little so many on the anti side seem to know about guns, I suspect that many of them haven’t even handled a gun, or maybe have but were never taught proper and judicious handling of them. Time to hammer away that point. Baa! Baaaaa! So TacStrike posted a link to a post by Rob Tackett on their Facebook page, essentially calling for civility. First off, I’m disgusted by the use of the stupid and grammatically awful ‘hate speech’ moniker. The Facebook poster who shared this article called it an amazing article. It isn’t amazing to me at all. Just naive. The posts he cited that he deleted; sure, it made sense to delete those. However, he fails to note the chilling fact that Rob Allen notes: The antis are more coordinated than ever. There’s also this little tidbit discussing the Alinskyite tactics the left is using, now, as we quibble about civility. Don’t forget to read the good news in the Kurt Schlichter op-ed referenced in that article regarding the fact that the left is loosing the narrative and they are in a panic. We can only hope that that is true. Rob at TacStrike, I’m sure, is well meaning. In the article he lists the five points below. My response in bold. We the People have to be better informed of the facts. We the People have to be patient and calm when addressing those that don’t understand our position. We the People have to present ourselves as a knowledgeable, insightful and morally just. We the People must not fall to the level of name calling, harmful rhetoric and hate speech. We the People must not give up and believe that taking up arms against our fellow man is the answer. The left is desperate and will stop at nothing. They know this is their last stand and they don’t care what we have to say. They will ram through whatever ban they’ve had wet dreams about for decades, including forcing owners of most semi-auto rifles to register them as if they are NFA weapons, or outright confiscation. If they can’t get it through the legislature, they will attempt it any way they can. I, for one, will pull no punches. Let’s do what Joe Huffman suggests and make sure this is their last stand. Alinsky tactics are truly subversive, but if we are going to win this and really make this their last stand, I, for one, am convinced that using Alinsky against the Alinskyites is a necessary part of the battle. Not for everybody, sure, but I’m tired of seeing these calls for civility when the left gives us no such quarter. I’m not suggesting incivility for the sake of incivility, but publishing the reporters’ addresses was a perfect response to their disgusting display, demonizing gun owners ala Alinsky. Update: And this is classic turnabout-is-fair-play. A Time for Mourning or a Time for Politics? Like some others, I will not name the monster who apparently killed at least 27, including at least 20 children ages 5-10 at a Connecticut school. However, unlike others, I will not simply quietly pray in the corner while the podium is ceded to another kind of monster: the gun people control advocate. This was shared by [my] nephew, […] and it generated quite few comments (over 40), like the original from Guns Save Lives (over 60). To those who think we should shut up and not talk about the politics of guns so quickly after a mass shooting, consider this: take your complaints to the gun grabbers. Almost invariably, it is *they* who call for more gun control after every single mass shooting. It is *they* who dance in the blood of the victims before it even hits the ground. In the first article, a couple of animals — no, that’s an insult to household pets everywhere — amoeba-brained dirtbags try to shoot up and cut up some students. They manage to kill one and injure six before a couple of armed school counselors put the excrement down. With guns, of course. Contrary to what you might have been told, they do do some good. In the second one, 23 people are killed injured [Correction: injured, not killed — sorry] before the scumbag is arrested. What did he use? A gun? Nope. A knife. And the article mentions another attack two years ago where 31 people were killed injured [Correction: ibid]. With a knife. Can you guess what the response was? Well, I can’t, either, because he never responded. So I ask again, and he changes the subject. I entertain him, anyhow, and he goes away. Granted, he might have just gone to bed or signed off Facebook. I doubt the latter, since he’s posted from his mobile phone a few times, and if it’s like most mobile phone FB apps, it does tell you when someone’s replied to your posts. These monsters need to be squashed like bugs, humiliated, dragged through the mud, in the midst of their dishonoring of the dead. Don’t like us responding to them and working on destroying them politically, even in the midst of mourning? Tough. Bring your complaints to the monsters. Not us. They are looking for every opportunity to soak us in the fresh blood of victims. I will not let them define us. So my answer to the title of this post is, quite simply, both. Followup on this post: Since others have pointed this out, I wanted to be clear that Alan Korwin has disavowed that letter circulating claiming to be written by him. It has some content he wrote back in 2008 when it was actually true (HR1022 I believe), but is surrounded by some inflammatory language that he did not write. A pox on the dweeb who falsified this. No matter, though, at least in my case. The guts of my post is still true. The concern is less the legislature than the administrative rule making.